It's sort of comical watching the Conservatives go through contortions trying to equate difficulties the Leader of the Official Opposition experienced this morning with a new employee (working the gate on Parliament Hill) with their numerous ethical, legal and moral sins. Dear Conservatives .... show us the $90,000 Nigel Wright cheque!! 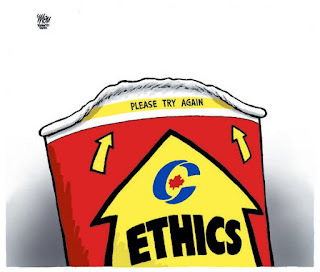 OTTAWA - The RCMP says there's enough evidence to start a criminal investigation into the $90,000 the prime minister's chief of staff gave to Sen. Mike Duffy to cover bogus housing claims.